The first flatiron building in North America was TORONTO’s Coffin Block, constructed in the triangle formed by Front and Church Streets. The stubby little structure housed the offices of a stagecoach company. 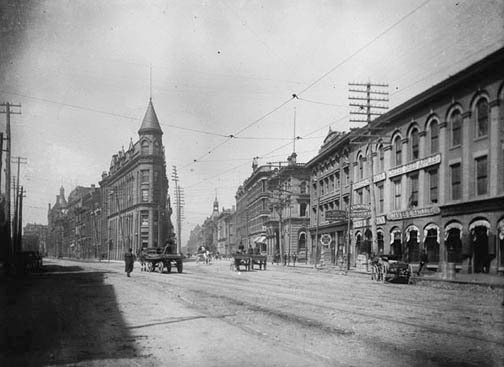 It was demolished and replaced in 1892 by the present day Flatiron or Gooderham Building. <PHOTOS ABOVE – the original and its replacement>. New York City’s Flatiron was completed in 1903. The present-day Flatiron was constructed for $18,000. Until 1952, it contained offices for George Gooderham of the giant Gooderham and Worts Distillery. There’s now a pub in the basement, a patio outside, and Berczy Park in behind. The Flatiron is close to three theatres, St. Lawrence Market, St. James Cathedral, Hockey Hall of Fame and numerous fine restaurants and pubs. This entry was posted in History & Institutions and tagged Canada, Ontario, Toronto, Toronto's Flat Iron Building. Bookmark the permalink.